1860 Saloon, Game Room & Hardshell Café is proud to be in the heart of Historic Soulard, a St. Louis neighborhood gem. This neighborhood is vibrant and thrives today for many reasons. The people who live and work in Historic Soulard take pride in their home. Soulard attracts friendly souls who are comfortable with themselves and make others feel the same. The neighborhood is oozing with acceptance and casualness. It’s evident as “Soulardians” drive their golf carts, take time to chat, and participate with neighbors and visitors alike in the many local events. Even with their fur-babies. The locals don’t walk the dog as a “chore”, they are on a stroll to experience the parks or stop by the outside tables for a drink and conversation with whomever comes by. The Historic Soulard neighborhood stays strong with locally owned stores which meet the needs of both Soulardians and visitors. The Porch is a go-to place in St. Louis for unique gifts, many that share our sense of humor! And it’s a relief to walk in an old-world hardware store, be greeted by a smiling face and asked if help is needed. Edele & Mertz Hardware doesn’t need a website, but their Yelp reviews are stellar! Soulard Farmers Market is the oldest continually operated farmer’s market west of the Mississippi River. It’s architecturally significant, as the design is based on a Renaissance era hospital in Florence, Italy. The market is open year round from Wednesday to Saturday. While picking up produce on a Saturday morning, many have a tradition of stopping by Julia’s Market Café for a Bloody Mary! Around the corner there is a lovely flower shop, Riley’s Florist, to pick up flowers for window boxes. And reliable neighborhood grocery store founded by one of thousands of early 20th century immigrants, Vincent’s 12 St. Market. Soulard is also attractive to both residents and visitors for its convenient location. One mile south of Busch Stadium, within quiet tree-lined streets, there are beautifully maintained homes, apartments and lofts. Restaurants and businesses are mingled among them, just like over 100 years ago when everyday living was within walking distance. But right outside neighborhood, there is easy access to the highways. 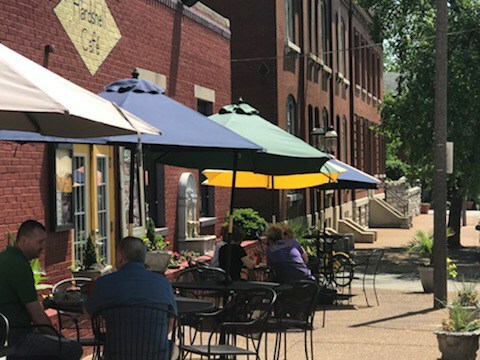 Several local businesses help residents with options for living accommodations, including Soulard Lofts (previously a baby carriage factory), 1400 Russell , and Red Brick leasing. And there is a cozy short stay option called Geyer House. Two active non-profit neighborhood organizations embody the pride of ownership and belonging in this community. The Soulard Business Association and the Soulard Restoration Group work year round to support businesses and residents, as well as welcome visitors with open arms. Some events, promoted on their social media, include the Holiday Parlour Tour, Summer Concerts in the Park, June’s Sample Soulard Sunday and Oktoberfest. Both groups are very involved with the annual Mardi Gras events (stlmardigras.org). Visit Historic Soulard and 1860’s! Come and visit the Historic Soulard neighborhood, park free in the lot across from 1860’s and experience lunch or dinner with us. 60’s (as the locals refer to the place) has three separate rooms, each with a bar and the same Cajun/Creole-influenced menu (paying homage to the French Louisiana settlers). The 1860 Saloon hosts live blues, classic rock, soul and R&B performers 365 days a year. The Game Room is a great gathering spot for playing Golden Tee, darts, shuffle board and more. It’s a wonderful atmosphere for private parties Monday through Thursday. (Call or email for availability at 314-231-1860 or info@1860saloon.com.) Finally, the Hardshell Café has a New Orleans Mardi Gras vibe and sidewalk cafe seating. Be sure to take a selfie with the 10 foot tall Mardi Gras jesters. Before or after your meal and drinks we offer a stress-free complimentary shuttle downtown to Cardinals & Blues games. Visit our website for more information, including history, directions, the menu, music schedule, and more at 1860Saloon.com. Follow us on Facebook, Twitter and Instagram (@1860soulard).